02.16.2017 - 4 comments - book reviews, tips, tricks! THE AUDIOBOOK HAS LANDED!!!!! Because who reads anymore? 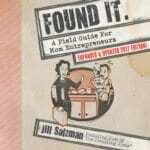 When Found It: A Field Guide for Mom Entrepreneurs came out in paperback in 2012, I demanded so much of you. Putting your phone down to pick up a book. Lifting said book up and putting it back down. But NO MORE exhausting yourself having to turn pages. Filed Under: book reviews, tips, tricks! “Practical and plucky, her advice is good for entrepreneurs regardless of family status. All of us have “kids” of some sort in our lives that require us to be flexible and accommodating. And the book offers a lot of tips for dealing with these situations without guilt and without losing sight of your business goals.